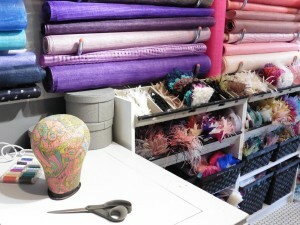 Petershams Millinery Supplies was born out of a love and passion for hats and materials. We specialize in vintage hat making goods, and modern supplies with vintage flair. Our London based shop has everything you need to make a one of a kind hat as well as workshops for those wanting to learn more about the craft of millinery. Ever wanted to try out hat making? Our evening fascinator taster workshop is designed for beginners and is a great way to dive in head first into the world of millinery. At the end of the evening you will have a beautiful fascinator hat to take home! We will be using traditional techniques to make modern fascinators and explore how to use specialist materials to make one-of-a-kind hats. This course is suitable for brides-to-be, ladies day racegoers and for those looking to gain insight into the fascinating world of millinery. Our courses are taught by London based milliner John Westwood Hill of JWH Millinery. John’s work combines cutting edge 3D printing fabrication along with traditional millinery techniques to make one of a kind hats that has caught the eye of fashion forward clients and celebrities.